Food waste is to be recycled from thousands of homes for the first time in Lincolnshire for a year-long trial. Food waste is to be collected from 4,700 selected homes in Grantham, Stamford, Bourne and nearby villages. South Kesteven District Council residents who currently dispose of food waste as non-recyclable rubbish are to take part in the trial. 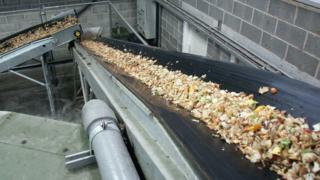 Food waste can be turned into soil conditioner and generate electricity using anaerobic digestion. The process uses microorganisms to break down the waste, in the absence of oxygen, inside an enclosed system. Using this system food waste can be processed in a less-expensive and more environmentally friendly way, said the council. Food waste is estimated to cost the average family £700 per year, it added. Householders on the trial are to be given a kitchen bin and a larger lockable box to be kept outside. Bread, meat, fish, peelings, dairy products, egg shells, teabags, plate scrapings and any food past its use-by date would be accepted. Councillor Eddy Poll, of Lincolnshire County Council, said the trial would help gather information to "better manage our waste and recycling". Lincolnshire Waste Partnership hopes to gauge participation rates during the trial funded by Lincolnshire County Council.